Stay current with the latest technology. Use computers whenever possible to perfectly diagnose and prescribe any vision problem. Trust decades of experience to figure out more complicated issues. Technology is only as good as the operator. Continue to learn and study about the latest advances in vision care. Hire the friendliest and most helpful staff available. From the firm’s Optometrists, Dr. Barry Leonard, Dr. Javier Villalobos and Dr. Daniel Pollack, to the entire staff of technicians, clerks and assistants: kind, compassionate vision care is everything. Always carry the most current and fashionable frames and contact lenses available. Stay at the very forefront of LASIK surgery and other corrective eye surgery techniques by maintaining a partnership with the most advanced LASIK centers in Los Angeles. Of course, there’s more. And we invite you to review our website to discover answers to common vision questions. Take some time to learn about what may be affecting your vision. You’ll also get a behind the scenes look at our office, conveniently located just off the 405. 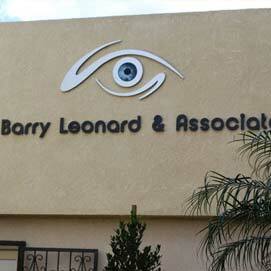 And, of course, Dr. Barry Leonard: the man who many call the Best Optometrist in the Valley.